In the history of data processing and computer science the early 1960s were a phase of fundamental decisions. Standards in computer architecture and hardware that are still valid today were established to a large extent. The period of prototypes was finally over. Driven by the military needs in the cold war computers had become industrially manufac- tured products. At the same time a profound discussion about the nature of the computer arose. On the one side were those arguing that the computer was a means for mechanization and automation of mental activities. For the advocates of this direction the human user was a potential disruptive factor and should therefore have as little possibility for intervention as possible. On the other hand the human factor was considered central for system de- sign, and the organization of hardware and software was oriented towards the needs and abilities of the user. 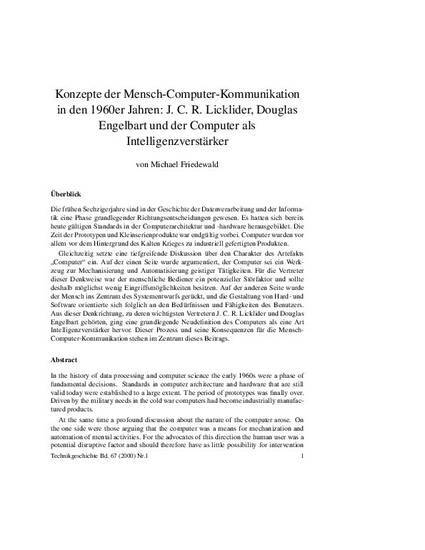 A fundamental redefinition of the computer as a kind of intelligence amplifier originated from this way of thinking. This article focuses on this process and its consequences for the development of human-computer interaction.